Gaithersburg, MD, January 04, 2019 --(PR.com)-- Local Maryland Event Company Owner brings his inspiration from the Lincoln Memorial to the People. Peter Smith, owner of Uniquely DC in Gaithersburg, MD is a 35 year veteran of the special events and production industry having produced thousands of events around the world. After relocating to Maryland in 2012, Smith opened Uniquely DC near his home in Gaithersburg to produce memorable events and productions across the DMV. While on a visit to the National Mall in Washington, DC a few years ago, Smith was overwhelmed when he visited the Lincoln memorial. "It truly inspired me and touched my heart" - it was then he determined he wanted to share his inspiration with the people of this great nation. Smith and his team are sculpting/carving what will be the second largest sitting Lincoln statue in the world. Nearing completion - this 50% scale replica statue will rise to 9.5' in height and then be placed on a 3' tall faux marble plinth. 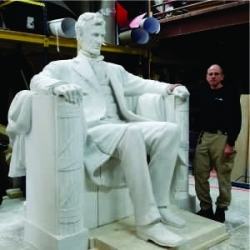 Uniquely DC will bring this statue along with towering 2' diameter fluted columns, a 14' tall re-creation of the Lincoln epitaph and Gettysburg Address walls, portraits and much more to corporate business meetings, special events, tradeshows and exhibitions throughout Maryland, Washington DC, Virginia and beyond. Giving Back - Throughout the Spring and Fall 2019 school year, Uniquely DC will be bringing this monumental display along with an educational and interactive "Living Lincoln" history program to elementary & middle schools in Maryland, Washington DC and Virginia once a month at no charge. Schools will be selected at random from hand written essays received in the mail. The education program is being developed by Smith's wife - Dr. Nancy Smith of Montgomery County Public Schools. Uniquely DC welcomes a local media partner for this educational promotion.